This is one of those books that’s been staring at me from one of my many New Books displays for quite some time now. It was published in May, which means it probably sat, unread, for at least three months. I am so dramatic. People do check out books – even GOOD books – all the time! In fact, a quick check proves this book was checked out three times before I got my hot little hands on it. Anyway, I digress. This book was published awhile ago, and the buzz has been buzzing ever since. Someone told my mother it was “The Best Book I’ve Ever Read In All Of My Life.” Now I don’t know if I will go that far, but about two chapters in, I was already nodding along with the insanely glowing blurbs on the back cover. And that’s saying a lot! Look at this! It did make me catch my breath. It reminded me of the beauty of words and the beauty of nature. And classic? Well, yes. It has all the qualities of a Charlotte’s Web, a James and the Giant Peach. 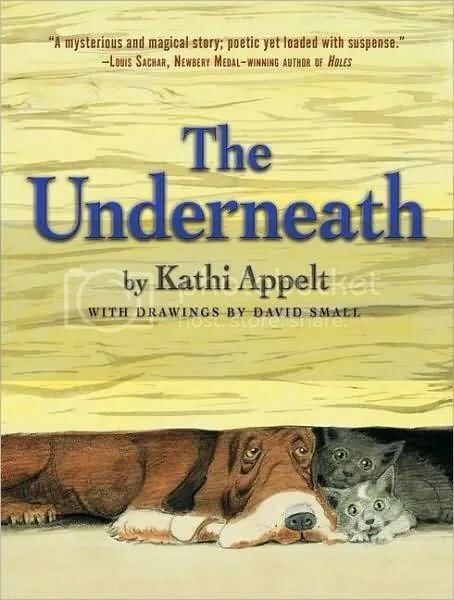 The Underneath is the story of a calico cat, abandoned on a lonesome strip of road in the bayous of Western Louisiana. She finds shelter in The Underneath – the area under the porch of an isolated home. A chained up hunting dog, Ranger, lives there too, because his owner – a grizzled, ruthless loner named Gar-Face – accidentally shot him in the leg and wants nothing else to do with him. When the calico cat gives birth to twin kittens – a boy and a girl – they are a family of four, safe in The Underneath, not leavin except in the night to hunt for sustenance. And they are happy – Ranger happy for the company, and the little kittens happy to roll around and play-hunt and be with their mother. But when Gar-Face notices he has unwanted tenants under his porch, he sets of a chain of tragic happenings that separate the family and leave one member stranded in the threatening, eerie grounds of the swampy bayou. It’s pretty easy to see the charm in this story – animals with families and friends, some suspense, a villian, et cetera. But where this book really shines, in my opinion, is that it doesn’t read like a picture book. Instead, Kathi Appelt weaves into her story folktale-like themes that tie the characters feelings to the greater feelings and energies in the world around them. She gives every creature in the bayou motivations, memories, and meaning – even the trees take a central role in the plot! And along with the story of the animals under the porch, there is an incredible story that took place thousands of years ago on the same land – a 100 foot long alligator, still living and preying, and a giant snake Grandmother who is trapped in jar buried deep beneath the earth. These semi-mythic creatures make the setting more vibrant and deepen the impact of the story. These characters have their stories as well, stories that recreate the stories told by native people on all parts of the globe.